A recent “Weekday Rambling” found John and me in Lafitte, Louisiana which is a small fishing village about thirty minutes south of the New Orleans French Quarter. We chose the Victoria Inn and Restaurant for our stay. The area is rich in folk stories and history. The town was named for the famed Robin Hood style pirate Jean Lafitte and his band of cronies who roamed and settled the area in the early 1800’s. It borders the Jean Lafitte National Park (http://www.nps.gov/) and Bayou Segnette State Park(www.crt.state.la.us/parks/ibyusegne.aspx). “Water, water everywhere” is certainly the area theme. The Victoria Inn’s owners originally built it as a residence, but decided to expand to a bed and breakfast and restaurant when they recognized the site was such a favored destination for vacationers (especially fishermen). The West Indies style building and beautifully landscaped grounds stand in juxtaposition to the “working” village of Lafitte. At the rear of the property is a gorgeous view of The Pen (lake) from the Victoria Inn pier. A unique attraction is the swimming pool in the pier. We chose this spot for a late afternoon beverage. 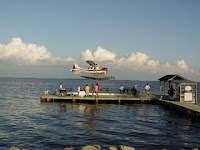 We also learned that guests can arrive via seaplane to the pier. This option would be good for tourists with a sense of adventure. Lafitte is a remote place and driving to it is tedious. A surprise highlight is certainly dinner at the Victoria Inn Restaurant. Chef Matt Regan cooks for a relatively small number of people each night (reservations recommended) and the atmosphere could best be described as casual and leisurely. There are unique culinary creations that will certainly please. Fresh seafood is available in abundance, and we recommend the Creole Bouillabaise and Bacon Wrapped Shrimp. The chef also offers to clean and prepare the fisherman’s catch for dinner. He will also pack a lunch for the fishing clients. Area attractions include the environmental visions of classic Louisiana swamps, and the state and national parks. 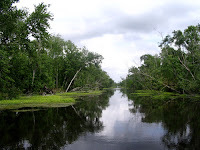 The Barataria Preserve was actually donated to the government by a local man who wanted to protect the area from the encroachment of civilization. Boat and hiking tours and fishing charters are available. If you decide to explore with your boat, be sure to check the weather and set your GPS. Boating and fishing options are endless! Another tip: watch out for the Intracoastal Waterway barge traffic. Upon encountering a huge barge while puttering around the bayou, we were forced to turn around for a very fast retreat! For those who didn’t catch any, or those who didn’t even “wet a line”, be sure to bring an ice chest. The fresh “catch of the day” is available at a number of locations for a reasonable price. If you don’t have to rise early for fishing, and don’t care to sit up in bed watching old VHS movies on the tube, late night entertainment is available after a short ride to the New Orleans French Quarter. One night we chose dinner at the Palace Café on Canal. It is a relatively new Brennan property located in the old Werleins Music Building. There are a lot of the original contents in the building and great food, beverage, and service. http://www.palacecafe.com/ is the link for this fabulous restaurant. Victoria Inn’s breakfast offers options based on the client. Early rising fishermen are offered cereals, breads, and fruits, and the late morning guests are offered a hot breakfast from 8 to 10 a.m. The gusting winds and cool temperatures gave us a good excuse to sleep in and choose the later option. The cool weather during our stay seemed to increase our appetites and we found a great lunch at Seafood Maison on Highway 45 directly across from the town’s high school. The suggested po-boy was the Crab Dressing and it was excellent. A Grilled Shrimp salad was a success as well. The portions were so generous, we decided to split. No problem there. The waitress was so pleasant and willing to accommodate us. Fresh was the word that described the menu options. With all the shrimp and fishing boats we saw that is easy to believe! If you are looking for a quiet and restful spot away from the busy city try Lafitte and the Victoria Inn.